Big Brothers Big Sisters of Honolulu and the Kamehameha Schools co-sponsor a program called Malama I Na Poki’i. This program matches a KS employee with an orphaned student in grades 4-6. 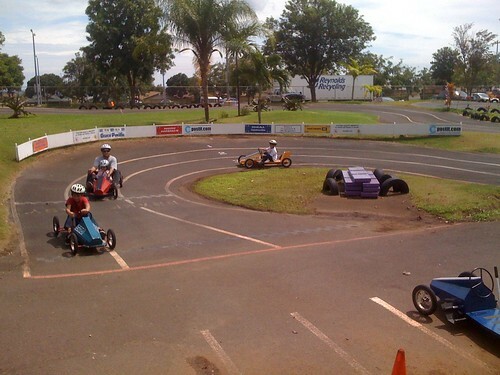 Today’s outing was a fun afternoon of box car racing at Race World Hawai’i in Kunia. Everyone had a blast. The toughest part was of course, pushing your box car back up the hill to race again. No, I did not win a single race. Obviously, I had a faulty car and the slow lane. But I’m not one to make excuses…. cough… ahem…. For more info on Big Brothers Big Sisters, check out the BBBS website at http://www.bigshonolulu.org/. I went box car racing before and it was super fun!